A disabled Elgin pensioner has decided to give donations made to help him repair his car to a toddler battling cancer. Earlier this month, Sandy Simpson was landed with a £125 repair bill after his car was vandalised in a car park adjacent to the St Giles Centre. Kind-hearted business owners rallied round, and put charity buckets in their shops in the hope of raising enough to cover the cost of repairing the Volkswagon Tiguan, which was left with a 20-inch scrape on the driver’s door. The buckets were due to be removed from shops including Baggs of Elgin, the Pastry Company, WH Smith and Witkowski Jewellers yesterday, but Mr Smith has convinced the businesses to keep them there a little longer – and to instead give the proceeds to little Eileidh Paterson. 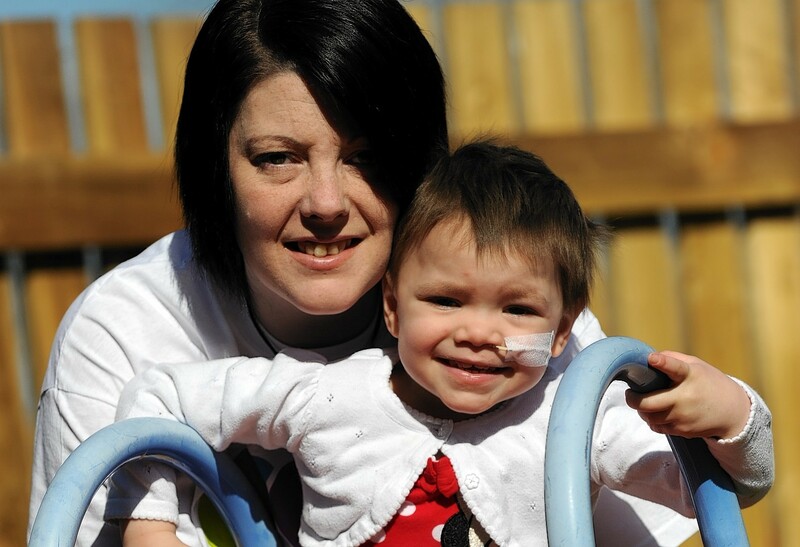 The three-year-old has high-risk neuroblastoma cancer, and last month her mother Gail launched a campaign to raise £100,000 to take her to the US for a drugs trial, which could reduce her chance of relapse by 80%. Eileidh’s story has touched the hearts of scores of people across the north-east, who have rallied round and helped raise nearly £70,000 so far. Now cancer survivor Mr Simpson is hoping to help take the family a step closer to their target by giving her appeal fund his car repairs collection. The 67-year-old said: “I’m just going to pay for all the repairs myself. “I’ve been reading about Eileidh’s story for weeks, and it really gets to you in the heart. “Any money leftover from the repairs would be going to a cancer charity anyway, and this way we are still donating towards cancer. “It’s such a shame Eileidh has to go to America for treatment like this, and it puts your own problems into perspective. St Giles Centre manager Angie Chisholm said the buckets will remain on display this week in the hope to boost the total as much as possible. Last night Ms Paterson, of Forres, said: “It’s so uplifting to know that someone who can ill-afford it chooses to give this money to Eileidh after such mindless vandalism.